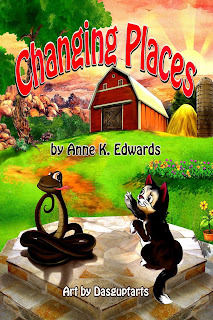 Anne K. Edwards’ two new children’s books were just published on Amazon Kindle. They are titled Dominick and the Dragon which is the first of a series and Changing Places is based on actual characters. The books are self-published and available only on Amazon Kindle or PDF from the author. Q. Thanks for letting us interrogate you! Can you give us a go-for-the-gut answer as to why you wanted to be an author? A. Reading from very early childhood fed a hunger based in loneliness. It made me want to write like the authors I admired. My first efforts came about in the third grade. At that time I was reading books ahead of my age and the horse stories by Walter Farley and books like My Friend Flicka started it all. I was in love with horses and wanted one. That was something that wasn’t going to happen so I gathered a herd of my own. Of course, they were all sticks and each had a name. I had four stallions and four mares, two of each color. Black stallions and mares were my favorites due to the excitement found in Mr. Farley’s Black Stallion series. My horses were all wild and I was the only one who could ride them. The sad part of my story about this lovely band was that some days I’d come home from school and find my largest horse standing on his head much reduced in status. My mother liked to cull my herd of eight, claiming one to become her new clothesline prop whenever an old one broke from being out in the weather and could no long bear the load of a full line. So I would replace it (usually my favorite black stallion) with another and go on as before. I rode the stick horses until I finally outgrew living my adventures with my little brother. But, oh, what lovely times we had until then. It was during this period that I began to live my adventures in my imagination and this led me to putting them down on paper, too. When my herd had moved on to greener pastures and my mother became the happy owner of a new clothes dryer, she lost her status as a horse thief. I can still remember those times and can relive them if I just close my eyes and let time flow backward. Of course, internalizing my adventures brought change with it, especially the urge to write and by age eleven I was trying my hand at short horse stories and sending them off to the important magazines of the day. And, no, you’d never have seen my name published in those days, but I loved the dream and hope that came with it. Every budding author should know that feeling. It feeds our souls. Q. Tell us (we won’t tell promise!) is it all it’s cracked up to be? I mean what are the perks and what are the demands? A. Absolutely, learning to write and the search for publication is all it’s cracked up to be, both the hard times and good times. It is an adventure in itself. The need for self-expression can strike at any age and demands some sort of satisfaction. Writing books in any genre grants me that. I don’t know if there are really any perks for the average writer of today unless it is that we are forced to learn by doing. We must do most or all of our own promotion, try to fit the writing in with family, the house and other demands we have gladly added to our lives. That said, if you like hard work and the great pleasure of sending something you’ve written to a publisher or doing the publishing yourself, then you have the best job in the world and little compares to that perk. There is no other feeling in the world like the one we experience when our work comes to fruition. The demands of being an author are usually the same for every writer. We must become almost hermit-like when writing, a life dedicated to solitude and full focus on our work. If we allow distractions of any sort while we struggle to write, we become part-time writers or hobbyists. This means we must make choices and perhaps divide our time into chunks, one for each part of our life. Added to that is much of our time is spent fruitlessly in chasing our dream. We must discipline ourselves to accept that fact and realize it is part of our education as a writer. We must study and read, seek out like-minded people and learn from their experiences. The biggest demand, and it is the one that hurts the most, is when something we’ve put our heart and soul into is rejected over and over, and we finally come to understand that what we’ve produced just doesn’t work as an article or story. We may have rewritten it ten times or more and still find it is flawed in some way, lacking something we just can’t see. Thus, we must humble our pride of having written and learn acceptance. That is a huge part of a writer’s education. A writer must be prepared to keep learning as long as they write. Q. Which route did you take –- traditional or self-published -– and can you give us the nitty gritty low down on what’s that like? A. I have taken both routes and find I really prefer the traditional-—that means having the security of a publisher to guide your work through the publishing process into ebook or print. Self-publishing is something I still think has a ways to go before I can find true success in it so I self-publish only that of my work that I know doesn’t fit publishers’ guidelines for the genre or an agent’s preference. Too often, I have submitted after receiving an email saying they’d be glad to read my book only to learn I’ve wasted my time. The favorite reason for rejection in those instances, I’ve found is, it doesn’t fit their guidelines, a statement that covers everything. 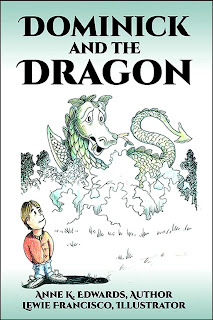 My two children’s books are self-published because they are too short for the standard children’s book and are basically meant to show children after a certain age can think for themselves in many situations and, hopefully, the stories also entertain. Knowing this, I don’t waste any time seeking a publisher because their guidelines don’t fit my story. I learned the hard way anyone seeking publication of their work must be prepared to waste time. It can be that an author will be told by an agent to rewrite their work and resubmit. If the author takes the time to do this before they have a contract, they will find to their dismay that many times that agent has already left her job for parts unknown and no other agent working with her will add them to their own workload. Or the same agent may decide that the rewrite isn’t what they want after all and drop the project. So one must consider well the use of time spent in having an agent while said writer is new to the writing game. Trying to gain acceptance by established agents usually comes to naught for various reasons and going to an agent no one has heard of, but who advertises widely for new clients, will prove a waste of time when one learns that same agent is only building a list of names of wannabe writers whose work they rarely put time into promoting. The disappointments these agents cause writers are that most of the time they don’t tell you, you are just one of too many, they don’t inform their clients when they move on, or they never show the clients’ work to a publisher. Those same agents often say don’t call and remain incommunicado to authors and/or they may take as long as six months or more to look at the author’s work, if they do. They don’t like to waste their own time but have no compunction about wasting that of a writer. They can actually discourage a budding author by this treatment. There are some fine agents but the writer must be very lucky to get an appointment with them or a recommendation by one of their clients. They are an overworked bunch when one considers the number of them to the multitude of us who want to be writers. The lesson I learned here was to ignore the disappointment and keep on writing. Luckily, I found I didn’t need an agent as the Internet made it possible to find a publisher and I have been very satisfied there. There are some parts of chasing success that can devour one’s whole life so a writer must decide how much time they want to devote to searching for an agent and success with a print publisher or saving that time to contact the small presses and find an opportunity for publication. Once published that way, many authors go on to realize their dream of acceptance by a large press. We must ask ourselves if the Internet is a step to the latter goal or will we be happy with it as our resting place. Q. Tell us for real what your family feels about you spending so much time getting your book written, polished, edited, formatted, published, what have you? A. My husband doesn’t mind my filling my time with writing as he considers it a productive hobby, but my furry children (no, not werewolves) known as cats show me as strongly as they can that they object. They sleep on the keyboard to show me it’s in use. They delete or add letters to a manuscript at the same time. Many times I’ve found added or deleted pages. They feel they have to teach me how to do things right also. If I get up from the typing table and take a break, one cat will hit the ‘off’ button. So I have learned to save my work. They think writing takes my attention from them, something they dislike intensely and I think they blame the machine. Sleeping on the keyboard, using it a scratching post, knocking the router and mouse about are some of their steps to revenge. Q. This is for pet lovers. If you don’t own a pet, skip this question, but do your pets actually get their food on time or do they have to wait until you type just one more word? A. I have several pets and they do not wait for me to stop and tend their wants. To get my attention, they start fights, pick on the littler ones, yowl for no reason, claw my clothes, jump in my lap and make sure one foot comes down on the keyboard. And that is only some of their tricks. It is better to feed them and then continue. It is also a useful survival technique. Q. In writing your book, how did you deal with the phone ringing, your family needing dinner or your boss calling you saying you’re late? A. This is an easy one to answer. I keep the phone turned off. My family members are adults who eat at different times and we make our own meals. I am retired and the cats are my bosses as I said in the previous answer. Q. What was the craziest or insane thing that happened to you in the book publishing process? A. The US Mail losing two manuscripts in a month is about as close as I can come to an answer here. This was in the days when things were typed on a manual or electric typewriter and lost manuscripts had to be retyped if lost. You could not send carbon copies to an agent or a publisher. I usually produce a book of about 300 pages so one might say they helped fill my time and kept me from doing anything new. When the email was made available, I was only too happy to sign on to use it. Of course, there were the times when our server would cut off in the middle of sending and it had to be resent, but that is only a few minutes lost at most. This is one of the things that will drive a writer over the wall so it only proves one has to be slightly crazy anyhow to be a writer. Q. How about the social networks? Which ones do you believe help and which ones do you wish you could avoid? A. To be honest, I find the social networks are not much use. I’ve tried several of them and was left wondering why I bothered. I didn’t try to sell books on those I did sign onto, but I got a huge increase in junk email and now have to spend too much time deleting. Q. Book sales. Don’t you just love them (or lack of?)? How are you making the sales happen for you? A. Book sales and book fairs are a mixed bag. They charge fees for a spot at one of their tables which one might consider fair. However, often they have well known authors in attendance who they put at the front tables, and the lesser or unknowns in the rear and the tables are often set up so the visitors can’t reach them. I came to the conclusion this was a way to funnel visitors where they’d spend the most money and less time. 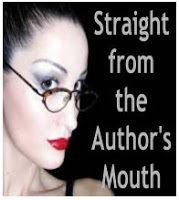 Some events call themselves book sales and invite all authors to be part of it. But their purpose is to sell used books from libraries or other such sources and the authors are merely an additional draw to get a larger turnout. Here too, visitors are funneled in specific directions and the visiting authors are ignored. I’ve been fortunate to be invited to meet readers at some Brick and Mortar stores and found them to be the most productive. The best one I attended was where I sold several copies of a book and spoke to a group in a mix of questions and answers. This gave me the chance to as questions as well as provide answers to others. Readers can teach an author. Out in the world there must be other types of book sales, and someday I hope to find them. Face-to-face meetings with the readers are a lot of fun if you can talk. One other comment, I’ve found the giveaways like bookmarks, information sheets about books are mostly thrown away or ignored. Since most of us are not wealthy, we must decide with care to spend our promotion funds. Q. What is one thing you’d like to jump on the rooftop and scream about? A. Joy in the adventure of becoming a writer. I’ve been learning for decades and find there is always something new coming my way. I often need to push myself to do that learning, but if it is necessary, I will eventually get to it. It’s a wonderful way to stay in touch with one’s inner person. And I love to tell silly tales about my muse. Evreybody should have one, writer or not. Those stories provide me a way to laugh at my writing problems. So give your muse a pat for me and keep it busy. Never know what ideas they will come up with. Q. Okay, too much sugar for you today! Here’s a nice cup of Chamomile tea and come on over and sit under the cabana and watch the waves roll in. Now…can you tell us what you love about being a published author and how all those things above doesn’t matter because it’s all part of the whole scheme of things and you wouldn’t have it any other way? A. I think I’ve said it all above. Personal satisfaction. There are so many people I meet who have no hobby or interest after retirement. I think this is what makes them age mentally which is too sad for words. Writing keeps me interested in the world, its problems, talking and listening to new acquaintances, and what goes on around me. I can turn things I think were fun or silly incidents into a book. And creating new worlds in words is a wonderful way to keep depression at bay. It is to laugh.